The natural resources of Porter County have long been exploited for various reasons. As early as 1835, the year prior to the formation of Porter County, a sawmill was erected at City West, to process eastern white pine (Pinus strobus) into lumber for use in building that community and for export to the budding villages of Chicago and Michigan City. Land in the southern portion of the county was drained with an extensive ditch network so that more arable land would be available for agricultural purposes. 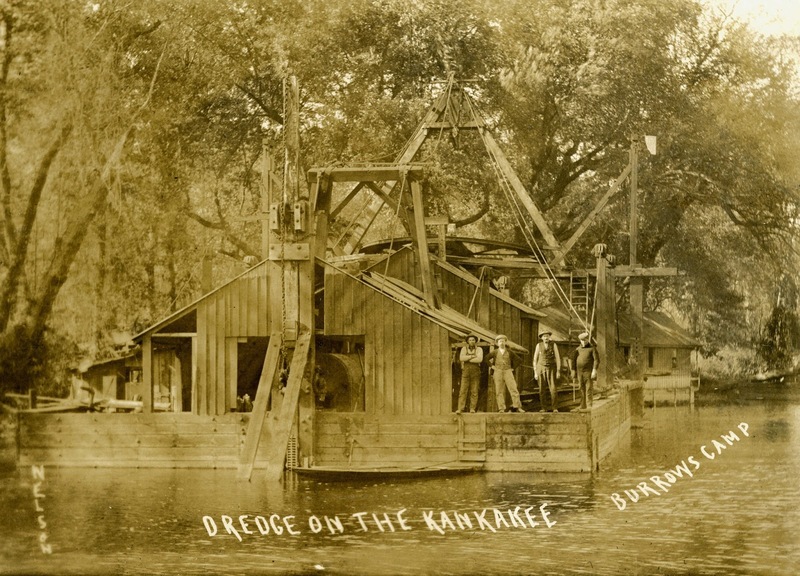 About a century ago, the Kankakee River was straightened and deepened and renamed Marble Ditch. The purpose of dredging the river was to better convey water away from the southern reaches of Porter County. Postcard showing the dredging of the Kankakee River, 1909. Sand was another resource that was mined extensively in the townships of Pine, Portage, and Westchester, especially after the Great Chicago Fire of 1871. Extensive sand mining was taking place in Westchester Township well into the 1970s. When Interstate 94 was constructed, the Dyer Construction Company mined sand in the Burns Harbor area to be used for raising the highway's roadbed. In addition, an estimated 2.5 million cubic yards of sand was removed during site preparations for the construction Bethlehem Steel Corporation's facility along Lake Michigan during the 1960s; Northwestern University in Chicago purchased this sand as landfill for its campus expansion project. 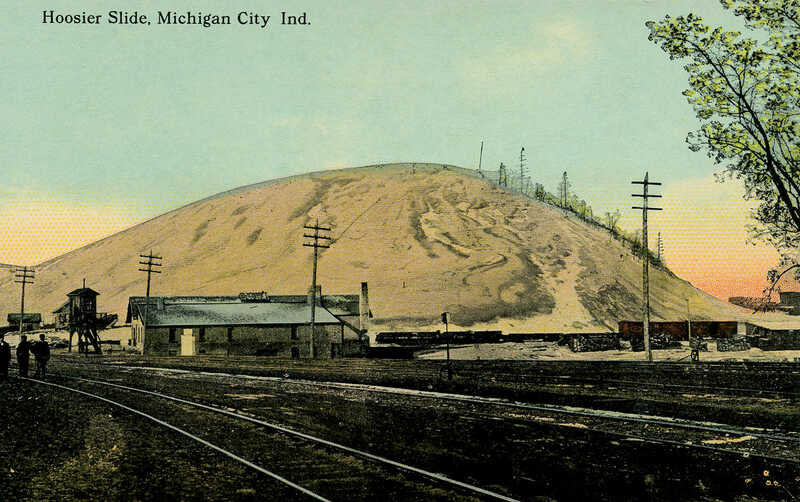 In neighboring LaPorte County, a massive dune named Hoosier Slide, one of the largest dunes along the Indiana shoreline, was mined and its sand shipped by rail for a wide variety of commercial purposes. Much of this dune's sand was sent to Delaware County, Indiana, to supply the glass manufacturing industry that was clustered around Muncie. Hoosier Slide was completely leveled by 1920, resulting in the removal of an estimated 13.5 million tons of sand. 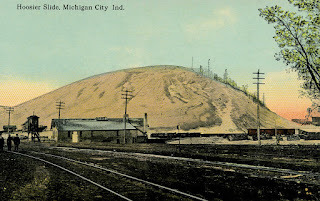 In 1925, the Northern Indiana Public Service Company purchased the Hoosier Slide site where it would later construct its Michigan City generating station. Postcard of Hoosier Slide at Michigan City, LaPorte County, Indiana, 1914. 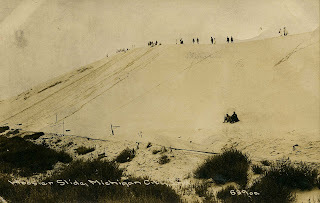 Postcard of Hoosier Slide at Michigan City, LaPorte County, Indiana, circa 1915. Unknown to most Porter County residents is that the county played a significant role in the loam industry. Loam is a soil containing sand, silt, and clay in a relatively even mixture. While loam soil is found throughout the Midwest, the loam at particular locations in Porter County was determined to be exceptionally well suited for use in loam molding within the steel industry. The loam would hold enough water to maintain form for molding purposes, but also contained the proper amount of sand to allow excess moisture to drain and gases to escape. Molding sand of excellent quality occurs in abundance at several localities in the two counties [Lake and Porter]. The best-known deposits are on the lands of L. H. Robbins and Theodore Swear [Schweir], near McCool, Porter county, sections 7, 8 and 17 (36 north, 6 west). These deposits occur over the greater portion of the three sections, and shipments have been made from these for six years. The soil is stripped; the "loam" separated from the molding sand and sold for lining ladles and cupola furnaces, and the molding sand for making castings. Each foot of thickness yields about 70 carloads per acre. Southeast of Valparaiso, in southwest quarter of section 34 (35 north, 5 west), and north half of section 3 (34 north, 5 west), are also deposits of molding sand, much of which has been shipped to Chicago in recent years. The main deposits are close alongside the "Nickel Plate" Railway. The sand here is a dark brown, averages from two and one-half to three and one-half feet in thickness, and is overlain by six inches of soil. On the roadside one-fourth of a mile east of the Methodist Church, near the center of Section 15, Washington township, Porter County, is also an exposure of molding sand, deeper-red in color and three feet in thickness. It underlies six inches of soil and overlies a thick deposit of ordinary sand. Theodore Schweir was born on June 24, 1852, in Fressnow, Hanover, Germany. In 1869, at the age of 17, he migrated to America, settling on property just north of McCool. He married Christena T. Miller in 1879 at Valparaiso. In 1892, the Schweir family moved to Chesterton. Theodore would die at his Chesterton home on May 29, 1939. Source: Collection of Brent Nimmo. 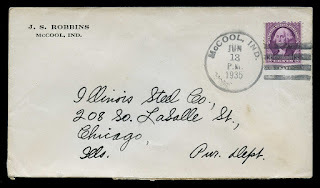 Joseph Samuel Robbins was born April 30, 1881, at McCool. Joseph was part of the first graduating class in Portage Township in 1895, which also included Henry G. Robbins and Bertha A. (Robbins) Andrews, Joseph's cousins. At the time, there were no high schools in Portage Township, so the class graduated after completing eighth grade. Joseph then attended the Normal School at Valparaiso and enrolled in the commercial course during his first year and the teacher's course during the second year; he would graduate from both courses. He then attended the Morgan Park Military Academy at Morgan Park in Chicago for one year, which was then a preparatory school for the University of Chicago. Afterward, Joseph registered at Purdue University in the agricultural course, from which he graduated two years later. Photograph of Joseph Samuel Robbins, circa 1884. Source: Collection of Thomas Turner. After attending Purdue, Joseph joined his father in farming and also operating a general store, grain elevator, and implement business at McCool. The post office of McCool was located in the general store, and Joseph was postmaster for several years. I was the only one who had a car in those days and I took Gertrude home from a dance the first time I met her. She fell for the car more than for me. He later had dealerships for the White Steamer, the Stanley Steamer, and the little wooden frame, one cylinder automobile known as the Brush Runabout. Joseph was the first business man ever to operate in the city of Gary, which at that time was nothing more than a barren of sand knobs. The only building in Gary at the time was the Calumet Club of Chicago's club house located on the beach of Lake Michigan, where the United States Steel Corporation's mill now operates. The first grading and leveling of the sand dunes was accomplished by horses and scraper, and Stein and Wyatt had the first contract for grading and leveling the sand dunes for the first steel mills. Joseph furnished Stein and Wyatt all the feed for their horses, shipping hay and grain from the elevator at McCool, which was situated along the Baltimore & Ohio Railroad. The feed and grain was unloaded at the old railroad shed owned by Calumet Club of Chicago on the Baltimore & Ohio Railroad. 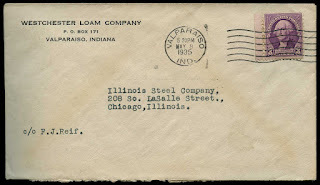 For many years, Joseph furnished sand and loam for the numerous foundries and steel mills located in Chicago and Northwest Indiana, shipping from his farm at McCool. This material was used to produce the forms for molten steel. Three full railcars of sand and loam were being shipped daily from the McCool area during the period of World War I. In 1920, it was reported that Robbins was using a Western Elevating Grader to load loam and sand into railcars. 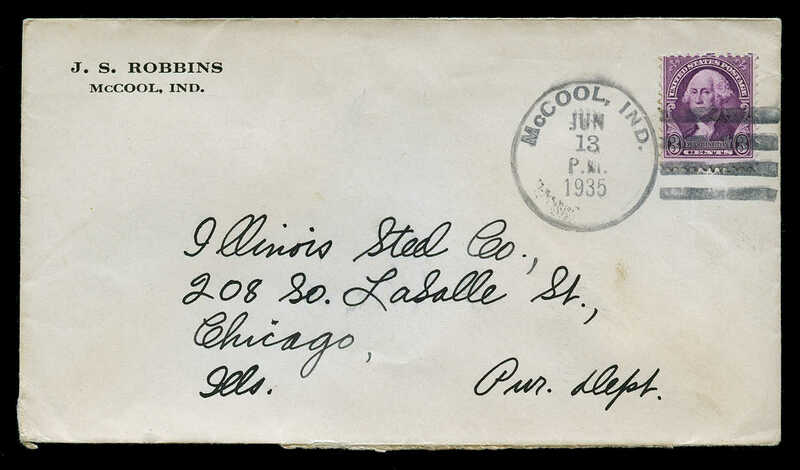 The postal cover below likely represents business communication with the Illinois Steel Company regarding the provision of moulding sand and loam from Robbins' operation. 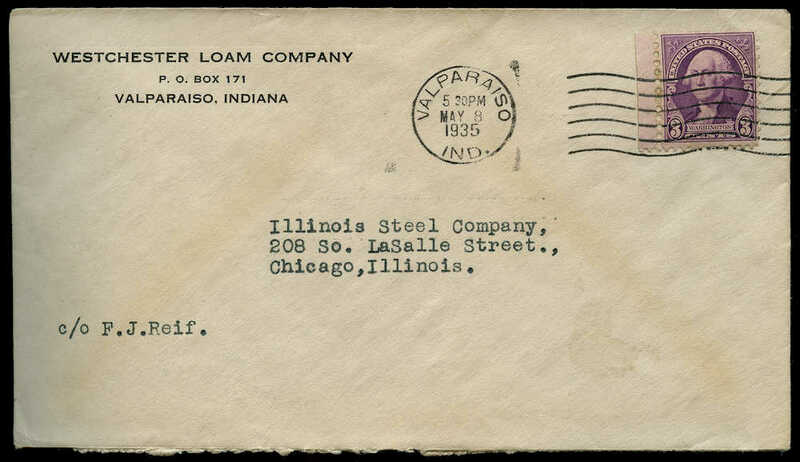 Postal cover sent to Illinois Steel Company by Joseph S. Robbins, 1935. Joseph S. Robbins passed away on October 5, 1983, at the age of 102, and was interred in the Robbins Cemetery in Portage Township. Gertrude, Joseph's wife, lived to be 106, passing away in 1994. At the time of his death, Joseph and Gertrude had been married for 76 years. 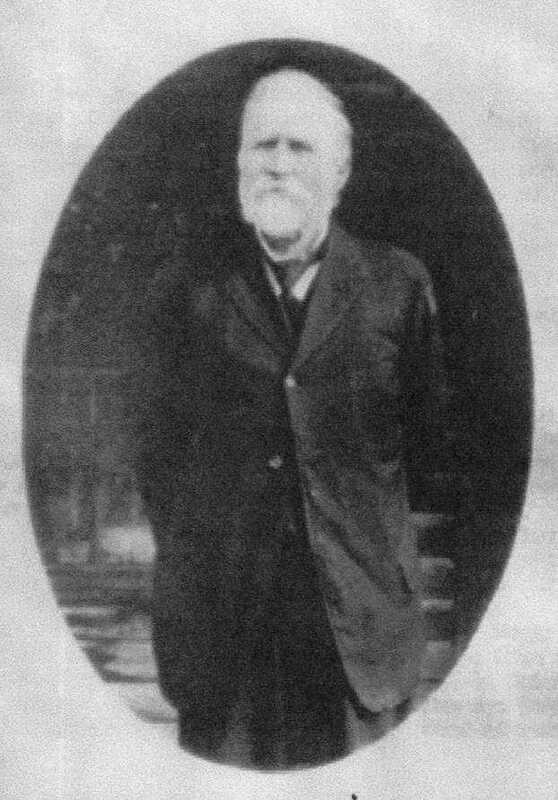 At one point in time, Joseph served as a president of the Porter County Historical Society. John N. LaHayne was reported to be "one of the most experienced of Porter County's loam experts." He entered the loam business around 1916 and was still active in the industry as late as 1933. He combined his loam business with the Westchester Loam Company (in 1932 or 1933). the Westchester Loam Company, 1935. LaHayne was born June 25, 1880. He married Blanche Irene Gustafson on December 24, 1902. Blanche, who was born on March 26, 1885, would pass away on October 29, 1925. John then married Evelyn M. Dion. Evelyn was born November 1, 1884, in East Stanbridge, Quebec, Canada, and passed away in Gary, Lake County, Indiana, on April 14, 1958. John LaHayne was tragically killed in an automobile accident on October 13, 1963, near Lake Village in Newton County, Indiana; Zoe L. Hudson, his landlady, was also killed in the accident. offering fifty acres of land for sale. Source: Chicago Daily Tribune, October 31, 1943. Another individual active in the loam industry was Carl Oscar Johnson. Johnson owned and operated the McCool Loam Company, which was incorporated in 1933 with a paid-in capital of $1,200. The McCool Loam Company was headquartered in Chesterton. Carl's first wife was Olga Stalhandske, who died on September 20, 1928. In 1935, Carl married Amanda (Hillstrom) Lindell, who also preceded him in death on October 18, 1945. Johnson was born February 27, 1878, in Crisman and passed away on September 4, 1950 at Gary. Column concerning loam shipments by John N. LaHayne. Source: The Vidette-Messenger, November 28, 1933. The McCool Loam Company operated as late as September 1947. While it is presumed that this organization mined loam mostly within the vicinity of McCool, it is known that the company also excavated loam one mile east of the village of Crocker in Liberty Township, in an area once commonly referred to as Whippoorwill Prairie, and mostly likely on property owned by the LaHayne family. The company also excavated clay and sand just north of Crocker in Westchester Township (SE¼ of NW¼ of Section 5, Township 36 North, Range 6 West). Charles H. Schrock would later own and operate the McCool Loam Company. Schrock was born in Portage Township on December 25, 1887. He married Emily M. Anderson on October 12, 1911, at Valparaiso. Emily would pass away on December 14, 1969, at Valparaiso. Charles died on December 19, 1982, also at Valparaiso. The Zehner Excavating Company would eventually absorb the McCool Loam Company. Nels Nicholson was born in Sweden on September 16, 1852, and arrived in the United States in 1868. He first settled in Chicago, eventually moving to Crisman in 1891 where he would farm and commercially mine sand and loam. 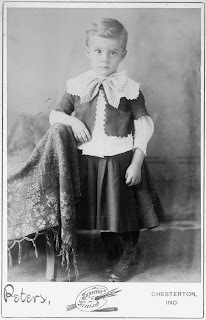 Nels was married to Jennie E. Anderson of Miller Station in Lake County, Indiana, and together they had thirteen children. Nels passed away on February 7, 1941, at his home in Crisman and was interred in the Bethel Lutheran Cemetery at Miller. 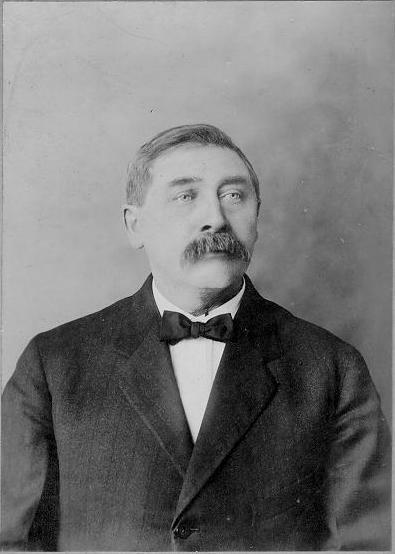 Photograph of Nels Nicholson, President of the Crisman Sand Company. Source: Find A Grave, Memorial No. 26180328 (contributor Verlaine Wright). Following Nels Nicholson's death, his nephews George E. Nicholson and Joseph N. Nicholson would operate the Crisman Sand Company. Like John N. LaHayne, brothers George and Joseph were killed in an automobile wreck. Their accident took place on Indiana State Highway 24, two miles west of Wolcott in White County, Indiana, on April 22, 1960. Both men were buried at McCool Cemetery in Portage Township. Despite the deaths of the Nicholson brothers, the Crisman Sand Company remained in business and is still operating today with an office located at Valparaiso. Another firm producing loam for the steel industry was the Portage-Manley Sand Company, which excavated material near Dune Park. Little is known concerning the operations of this company or its owners. Beck, John G. and Miles T. Babb. 1920. Among the Contractors. The Earth Mover 7(4):19. The Chesterton Tribune, Chesterton, Porter County, Indiana; June 8, 1900; Volume 17, Number 9, Page 4, Column 4. Column titled "McCool." The Porter County Vidette, Valparaiso, Porter County, Indiana; March 21, 1917, Page 5, Column 5. Column titled "Local Squibbs and Personals." The Indianapolis Star, Indianapolis, Marion County, Indiana; August 8, 1933; Volume 31, Number 64, Page 17, Column 8. Column titled "Incorporations." The Vidette-Messenger, Valparaiso, Porter County, Indiana; August 9, 1933; Volume 7, Page 3, Column 1. Column titled "Town Talk." The Vidette-Messenger, Valparaiso, Porter County, Indiana; November 28, 1933; Volume 7, Page 5, Column 6. Column titled "Finish Loam Shipments to Steel Mills." 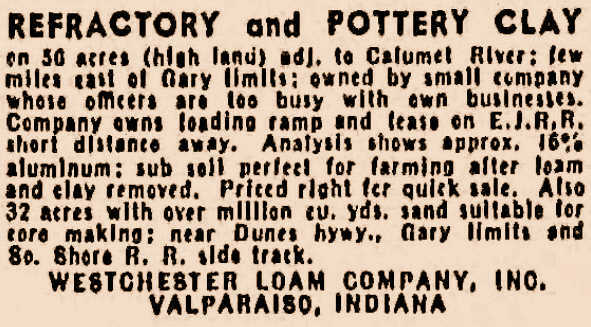 The Vidette-Messenger, Valparaiso, Porter County, Indiana; February 7, 1941; Volume 14, Number 286, Page 2, Column 7. Column titled "N. Nicholson, Portage, Dies." Chicago Sunday Tribune, Chicago, Cook County, Illinois; October 31, 1943; Volume 102, Number 44, Part 2, Page 9, Column 3. Column titled "Refractory and Pottery Clay." The Vidette-Messenger, Valparaiso, Porter County, Indiana; June 9, 1947; Volume 20, Number 286, Page 1, Column 1. Column titled "Local Police Plagued with Petty Crimes." The Vidette-Messenger, Valparaiso, Porter County, Indiana; September 20, 1947; Volume 21, Number 66, Page 1, Column 8. Column titled "Youth Put on Probation. Theft of Machine Parts at McCool Aired in Court." The Vidette-Messenger, Valparaiso, Porter County, Indiana; September 5, 1950; Volume 24, Number 52, Page 3, Column 7. Column titled "Carl O. Johnson, Lifelong County Resident, Dies." The Vidette-Messenger, Valparaiso, Porter County, Indiana; April 15, 1958; Volume 31, Number 240, Page 6, Column 3. Column titled "Deaths: Mrs. John LaHayne." The Vidette-Messenger, Valparaiso, Porter County, Indiana; April 23, 1960; Volume 33, Number 248, Page 1, Column 2. Column titled "2 Portage Brothers Are Killed In Crash. Porter County Cars Collide Near Wolcott." The Vidette-Messenger, Valparaiso, Porter County, Indiana; October 15, 1963; Volume 37, Number 87, Page 6, Column 1. Column titled "Deaths: John LaHayne." The Vidette-Messenger, Valparaiso, Porter County, Indiana; February 24, 1967; Volume 40, Number 198, Page 1, Column 1. Column titled "Over A Cup Of Coffee." The Vidette-Messenger, Valparaiso, Porter County, Indiana; February 17, 1971; Volume 44, Number 191, Page 1, Column 4. Column titled "To Prepare Sand Mining Requirements." 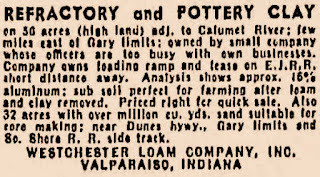 The Vidette-Messenger, Valparaiso, Porter County, Indiana; March 19, 1971; Volume 44, Number 217, Page 9, Column 4. Column titled "County News Briefs." The Vidette-Messenger, Valparaiso, Porter County, Indiana; April 8, 1974; Volume 47, Number 234, Page 9, Column 6. Column titled "Around This Area." The Vidette-Messenger, Valparaiso, Porter County, Indiana; March 6, 1976; Volume 49, Number 206, Page A7, Columns 1-6. Column titled "Robbins Family Property Settled in 1833," by Mary Henrichs. The Courier-Journal, Louisville, Jefferson County, Kentucky; June 8, 1999; Volume, Number , Page B6, Columns 4-5. Column titled "Southern Indiana Deaths."